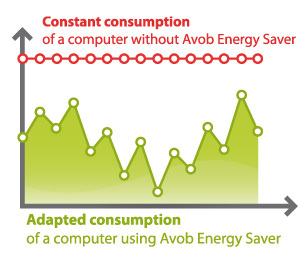 AVOB realises a 50% energy cost reduction for PC’s, and more to come..
End of the 90’ties, three young men won several prizes in international ‘Overclocking’ competitions. ‘Overclocking’ is a synonym for boosting computer power by manipulating the frequency of computer micro processors. From Overclocking to a Most Efficient system. Later the young men became engineering students at the ECE school (Ecole Centrale d’Electronique, a famous French IT University). The principles for boosting processor power were used but reversed to build a computer system as efficient as possible. An algorithm was created for on-demand real-time processor power, based on the applications that are in use at a given time. The system reconfigures a PC to use the processor power in a most efficient way. It also meant that the user could save a lot of energy ánd cost. Hence, the idea was born to reproduce the algorithm to the benefit of other companies. Pierre Duchesne, Sébastien Lavaysierre, Jean-Charles Matamoros founded ‘Alternative Vision Of Business’ (AVOB) and became respetively General Director, Technical Director and Marketing and Communications Director. Damien Valentini joined AVOB in 2008. Informatics engineer by education, he is now responsible for marketing, communication and design at AVOB. Energy Consumption per PC up to 160 euro/year. Chief Information Officers (CIO) tend to have no clue about the energy spend of their informatics equipment. Until now, they are rarely confronted with the energy bill related to the park of PCs, printers, fax machines, routers, servers in the company. End-users do not tend to turn off their computer, 44% say it is company procedure and 20% say it takes too much time [to re- launch the PC after a break]. French Ministries calculated that 13% of the total French energy consumption is related to IT which is rising 10% per year (1). 1. Detailed Energy Audits. During 2 weeks, a group of representative personal computers in different company departments are audited. Results are two-fold : (1) Detailed reports with Total Energy Consumption and Typical Computer User Profiles based on the applications (‘just outlook users’, ‘developers using heavy applications’, ‘assistants’, etc). (2) AVOB guarantees a Return on Investment of usually six months if the companies commits to implement AVOB solutions. 2. Installation of AVOB Solutions. AVOB installs a dedicated server or a virtual server to make sure that every PC processor will perform in the most efficient way. The AVOB Dashboard copies the IT Database structure, so the CIO immediately recognizes the configuration structure. The identified PC user profiles are used to configure the PCs of the different departmens accordingly (sales, R&D, marketing, etc). An important feature is the Sleep Mode Widget. The computer automatically changes to a lower processor power status when it is not used. Documents are automatically saved. And by a simple mouse or keyboard click, the PC is back operational indicating the amount of energy saved to the end-user. The end-user consequently is not bothered at all however well informed about this new energy saving measure. 3. Dashboard and Continuous Advice. In the next period the CIO is informed about the Energy Consumption of the PC park with various Dashboards. 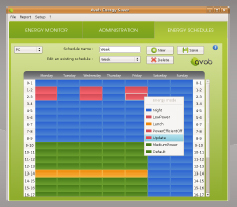 He or she can change Energy User Profiles, for instance based on a day-schedule : an automatic switch to a lower processor power at night or an appropriate higher level early in the morning at a given time for computer updates. Lastly, AVOB helps to identify elements that are using too much energy and advices on configuring new User Profiles or replacing old PCs. User Friendly : The installation of the Energy Saver software only takes a few minutes, on a central server. The application is running in the background of each and every individual PC and does not bother end-users. End-Users won’t loose any documents, documents are automatically saved before a PC is put in sleep mode. Secure : Energy Saver is approved by CISCO, Intel and Microsoft being an additional software tool that is performing well and save. Compatible : AVOB is adapting its database structure to the companies IT database, used for the registration of its PC’s. Hence, the CIO does not need to enter new PC’s on the AVOB Dashboard, it is automatically updated with latest information company information by pressing the ‘Refresh’ Button. Garanteed ROI : AVOB is committing to an ROI. A typical ROI is 6 months. The Technological partners of AVOB are Intel, Cisco and Microsoft. The Technological partnerships allow AVOB to further develop its expertise of controlling processor power into other domains of computer and electrical equipment. AVOB has ambitious plans. AVOB is constantly improving its solution. By the end of 2010 AVOB wants to have a Linux solution operational. Secondly it aims to have a position in the data center and router market, thanks to the partnership with Cisco.